Important Note: Sheets and towels not included in the rental price. Provided ur request 30 euros extra per stay. Very enjoyable stay and our host Patrick was very helpful even though he didn’t speak English and we didn’t speak French! Our only minor concern was that we were charged extra for bed linen, towels etc. 32 Euros with taxes. This was not made clear on the website. However we would recommend this gite and we would stay again. Thank you to Patrick and Marie for a very please stay and being wonderful hosts. Mirepoix and the surrounding areas are beautiful. Merci à Patrick et Marie pour un séjour très s'il vous plaît et être des hôtes merveilleux. Mirepoix et ses environs sont magnifiques. My husband and I had a wonderful week in this gite close to Mirepoix. 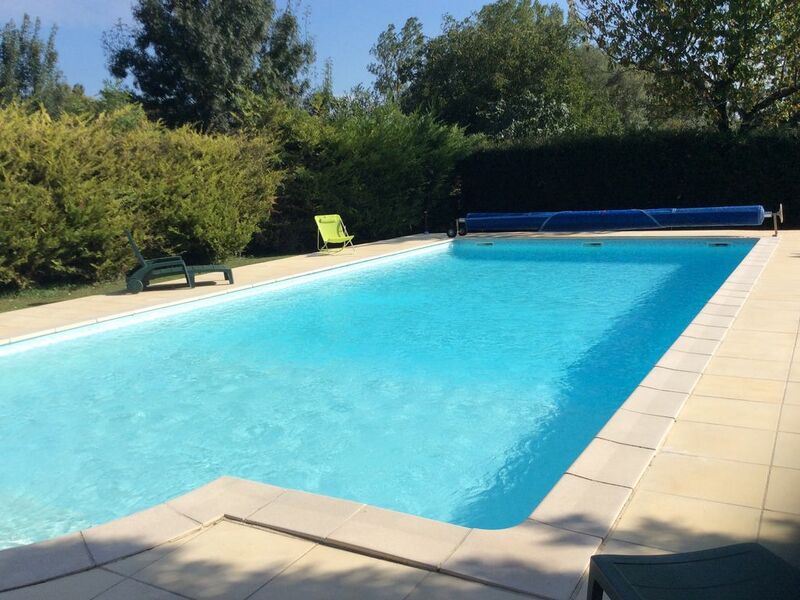 The gite is spacious, comfortable and well equipped with a covered terrace for eating dinner and you have the run of the gardens with table tennis, golf and darts to keep you busy. The pool is lovely and just the ticket for cooling off after a day of sightseeing. It is possible to walk to town over the fields, which was a relief as the road the gite is on is very busy. The hosts were extremely helpful and enthusiastic, lending us bikes when they discovered we enjoyed running in the sun. Great base to explore the Ariege. We stayed for a friend's wedding that was being held locally from 25th - 30th June. It was very easy to contact prior to our stay with very quick responses. Marie-Claude & Patrick were extremely welcoming and helpful when we arrived, even with our very weak French they were great at bearing with us! The grounds and pool are immaculate, also table tennis, badminton and other games available, it's a fantastic little place. The thick walls of the gitê meant that it stayed cool in the hot weather, there was plenty of information about the local area and a fully equipped kitchen. It is a 20 minute walk, or a few minutes drive, from Mirepoix, which is a lovely little town with easy parking availability and a small, but well stocked, Carrefour supermarket. A few more minutes away there is a Super U or Aldi. It's also a relatively short, quiet and easy drive to Carcassonne and lots of local sites. All-in-all a fabulous little place which we would definitely recommend to others. Merci, cela nous fait plaisir, que vous vous soyez plu chez nous . Nous avons été ravis de vous accueillir. We stayed for a week between 16th and 23rd June. The property is clean and tidy with the added bonus of a wonderful swimming pool and large beautiful grounds for visitors to use. Patrick & Marie-Claude were lovely, friendly, welcoming and very helpful and Patrick is rightfully very proud of the pool and the gardens. They don't speak much English and we have some limited French but we were able to get along absolutely fine with no problems. The three cats were also lovely and friendly. I was given wood and lighters for the fire at the start of the week which was unexpected but very welcome (it was chilly at night when we first arrived and having a fire lit was quite romantic). After the first couple of days the weather heated-up and we were able to relax by the pool and catch some sun for a couple of hours each evening after a days sightseeing. It's a beautiful place in the evening as the sun goes down. It's easy to find right off the main road and less than 5 minutes drive into Mirepoix with it's restaurants, Monday market and the Super U supermarket - a great location to explore the Pays de Cathare and beyond and come back home to at the end of the day! We ran out of time and would certainly come here again. It's one of the nicest places we have ever visited. Nous sommes toujours heureux, lorsque l’on s’est plu chez nous. Merci et, peut-être à une prochaine rencontre 😊. Je me mets à l’anglais, promis !